Mouse anti human RAD51 antibody recognizes RAD51 recombinase, also known as RAD51 homolog A, RECA, BRCA1/BRCA2-containing complex, subunit 5 or RAD51A. This antibody has been extensively validated for western blotting using whole cell lysates. 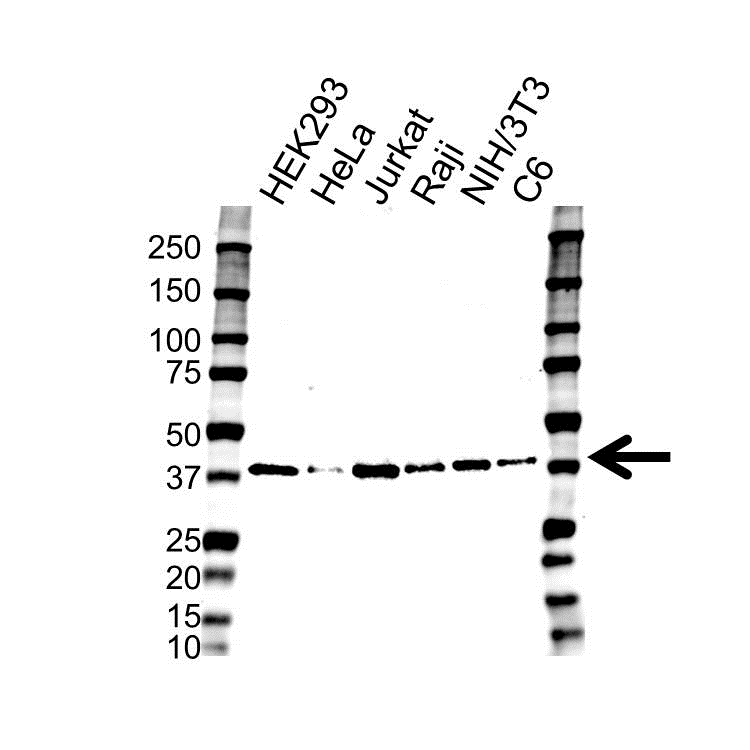 Mouse anti Human RAD51 antibody recognizes the DNA repair protein RAD51 homolog 1, also known as BRCA1/BRCA2-containing complex, subunit 5, DNA repair protein RAD51 homolog 1, RAD51 homolog A, RecA, E. coli, homolog of, RecA-like protein and recombination protein A.
Encoded by the RAD51 gene, DNA repair protein RAD51 homolog 1 is a member of the RAD51 protein family. RAD51 family members are highly similar to bacterial RecA and Saccharomyces cerevisiae Rad51, and are known to be involved in the homologous recombination and repair of DNA. This protein can interact with the ssDNA-binding protein RPA and RAD52, and it is thought to play roles in homologous pairing and strand transfer of DNA. This protein is also found to interact with BRCA1 and BRCA2, which may be important for the cellular response to DNA damage. BRCA2 is shown to regulate both the intracellular localization and DNA-binding ability of this protein. Loss of these controls following BRCA2 inactivation may be a key event leading to genomic instability and tumorigenesis. Multiple transcript variants encoding different isoforms have been found for RAD51 (provided by RefSeq, Aug 2009). Mouse anti Human DNA repair protein RAD51 homolog 1 antibody detects a band of 37 kDa. The antibody has been extensively validated for western blotting using whole cell lysates.